The gold price has been historically influenced by three main factors – currency hedging, jewelry demand and central bank activity. To these factors we add a fourth – the activity of Exchange Traded Commodity Funds. The use of gold for currency hedging goes hand in glove with central bank buying activity. When fiat paper currencies are under threat then gold is the instinctive hedge. Investors worried about holding euros, and also worried about the weakness in the U.S. dollar start buying gold. The developing weakness in the euro, and the potential collapse or restructuring of the euro zone, is the main driver behind the current gold rally. There has been an increase in demand for third party exposure to the market. This is provided by the Exchange Traded Commodity Funds. 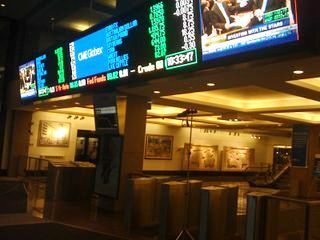 The Exchange Traded Funds now account for a significant proportion of gold trading activity and their investors are not motivated by the same concern as professional traders or gold industry participants. Underpinning this investment behavior is the consistent buying by central banks as they seek to build reserves to protect their currency. In 2010 and 2011 central bank buying provided a firm foundation for the prolonged uptrend. There is no evidence to suggest that central banks will become sellers in the near term future so this up trend support remains in place. This combination of factors has created a strong and sustainable uptrend in gold. 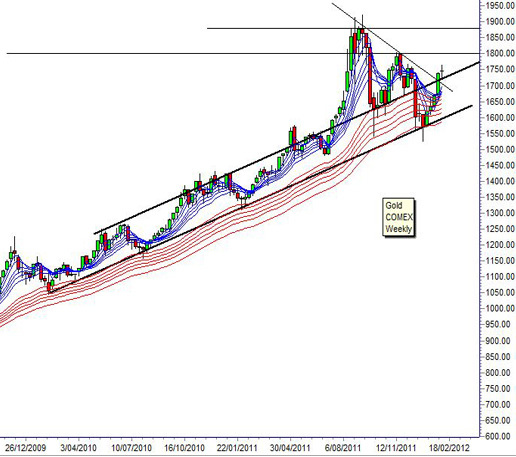 The weekly COMEX [GCCV1 1747.50 16.20 (+0.94%) ]gold chart shows a strong trading channel. Starting in 2010 April the lower trend line defines the lower edge of the trading channel. The upper edge of the trading channel is confirmed in May 2010. The current rebound rally starting from near $1,570 uses the lower trend line as a rebound point. Between May 2010 and July 2011 the gold price moved in a rally and retreat pattern inside the trading channel. The strong breakout above the upper edge of the trading channel developed in July 2011. After the peak near $1,924 in September 2011 the gold price developed a new downtrend. In October and November 2011 the upper edge of the trading channel acted as a support level. The rebound rally in October provided the anchor point for the new downtrend line. The rebound rally that has developed from the December 2011 low near $1,560 has two important features. The first feature is that the rally has moved above the upper edge of the trading channel near $1,720. The second feature is that the price has also moved above the value of the downtrend line, which also has a value near $1,720. This breakout above two important resistance features is very bullish. The first upside target is near $1,800. This is the peak of the November 2011 rally and it is a weak resistance level. The width of the trading channel is calculated and this value is projected upwards to provide the second breakout target. This is near $1,860 but there is a high probability the price will use the previous resistance level near $1,880 as a target level. The long established pattern of trend development inside the trading channel suggests that any breakout towards $1,800 and $1,880 will have the characteristics of a rally rather than a sustainable trend. This provides short term trading opportunities. In the longer term the gold price may return to trading inside the trading channel. Daryl Guppy is a trader and author of Trend Trading, The 36 Strategies of the Chinese for Financial Traders –www.guppytraders.com . He is a regular guest on CNBC’s Asia Squawk Box. He is a speaker at trading conferences in China, Asia, Australia and Europe. As predicted earlier this week (see Aug 9), CME Group raised the margins on Gold just as they did in May on Silver. CME Group, the world’s largest commodities exchange, raised margins 22.2% from $4,500 to $5,500 per new contract. While the retraction doesn’t seem to be as deep as the one with silver, it is still early in the process. This retraction by all account should be short lived as the global debt crisis over-powers any margin raises for the near term. The most recent concern is from the Euro-zone where questions of the French AAA credit rating powered gold over $1,815 in after-market trading. It seems that France may be next in line for a credit down-grade. In spite of this current retraction gold is still on track to have one of the largest gains since Aug 2008. There is enough uncertainty in the global markets that gold should pick up back into the $1,800’s by the end of the month. This is just the beginning of Golds chase of $2,000 by the end of the year, making for a potential of 13% gain should gold hit the mark. There is still plenty of opportunity to see gains on current acquisitions of Gold & Silver acquire now and watch your investment grow. Patrick A. Heller has a good article over on Coin Update News about the status of gold and silver supplies. In essence, the article makes a convincing case that the market for physical gold and silver is tight. He also explains that the gold market is in a rare condition referred to as “backwardation” in which physical spot gold is priced higher than gold futures contracts out as long as 6 months. This is a sure sign of a tightness in supply and is very bullish. You are currently browsing the archives for the COMEX category.